5. Next thing to check is how the gelato is being served. Traditional gelato is not served with an ice cream scoop or disher. Instead a typical gelato spatula is being used, which allows to 'work' the gelato before pressing it on the cone or into the cup (coppetta). That is because artisan gelato is generally served at a temperature of -15°C or +5°F whereas the serving temperature of regular ice cream is usually around -20°C or -4°F. In very touristy spot you may see 'gelato' served with an ice cream disher, but that is usually a sign that the 'gelato' has not really much in common with genuine gelato, because genuine gelato is less solid than regular ice cream and doesn't lend itself well to being served with an ice cream disher. 6. For the same reason, when ordering gelato you will not be asked how many gelato scoops you'd like, but just what size of cone or cup you wish. You can then choose to have just one or several different flavors, independently of the size of the cup or cone you have chosen. If you take two different flavors in a small cup you will just get less of each. You can also ask to have more of one flavor and just a tidbit of another, as portions are not standardized gelato scoops, but adaptable to your choice with the spatula. In the smallest cup you can usually have one or two different flavors, in the medium-sized cup, one to three and in the larger sized ones usually up to four. 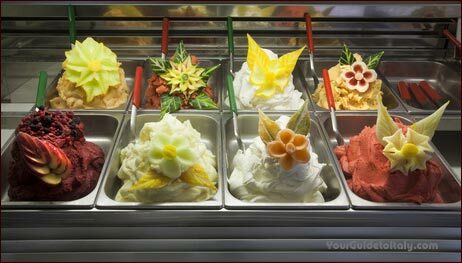 Even though this way of serving is typical Italian and may not be so common in very touristy spots, it is worth seeking for a traditional gelateria off the main street or piazza which serves gelato in the traditional way. Chances are high that your gelato will also taste better! 7. Quality gelato is made without preservatives, as it is not usually intended to be stored for long. It can be stored for a longer period of time, but the best gelaterie prefer to make fresh gelato on a daily or almost hourly basis. Top quality gelaterie actually only serve freshly made gelato because they know that after a couple of hours ice cristals are being formed within the gelato which changes the intensity of the flavor. So, a good sign that the gelato is really freshly 'home-made' is when you see that the different flavors are being 'refilled' in small batches, made on an hourly basis. 8. Personally, when I see that the presentation is really overdone, with huge piles of gelato and extravagant fresh fruit decoration, it tends to make me a little suspicious. As I already said, quality sells itself without having to be boosted. An extremely visual display may indicate that this gelateria is relying more on walkers-by than on a loyal clientèle, which may not be a good sign. 1. A good gelateria make their gelato on-site using fresh, natural and seasonal products. So it will usually have a sign saying: produzione propria (home-made, on-site production), gelato artigianale (artisan gelato), prodotto alla vecchia maniera (produced the old-fashioned way), gelato di una volta (old-fashioned gelato). 2. As we mentioned in the first point, a quality gelateria only works with fresh, natural and seasonal ingredients. This is especially true for the fruit-based gelatos, but also for many cream-based flavors. When all types of fruit flavors are available all year round it is usually a sign that the gelateria is working from semi-processed ingredients or artificial flavors. Move on! 3. Gelaterie in touristy spots can have up to 60 or 80 different flavors (gusti). Such a huge amount of different flavors is often (not always) a sign that the gelateria works from semi-finished gelato ingredients, which allows to create many different flavors from the same base. While it may be fun to walk through these gelaterie and even order a crazy combination of flavors, if you are looking for the genuine artisan gelato made in the old-fashioned way, you might prefer picking a less magnanimous gelateria with 'only' between 10 and 15 different flavors. How to find a good gelateria? 4. Likewise, avoid gelaterie displaying very flashy and colorful gelato flavors. In fact, as no artificial colors are being used in quality gelato, the shades of colors are much duller than in industrial ice cream: a light-colored kaki for pistacchio (no flashy green), greyish for banana and fig, and soft rose for strawberry. Only egg-based, chocolate flavors and the reddish fruit gelato have deeper colors. After these few tips on how to recognize a good gelateria it is now time to have a closer look at the differences between artisan gelato and regular ice cream. 9. The texture of good artisan gelato will always be much softer and smoother (creamier) than traditional ice-cream. 10. 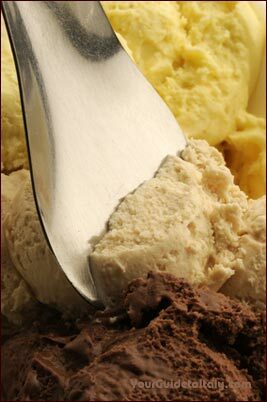 Even though it is smoother at the palate, traditional gelato has a lower fat content than ice cream. By definition, the main ingredients of handmade gelato are milk (at least 60%), sugar (14~24%) and cream (5~20%), while ice cream contains much more fat and less sugars (12 to 16%). Gelato contains only 5 - 8% butter fat (contained in the cream), while american-style ice cream contains up to 10 - 15% fat, which may stem from added processed vegetable oils or margarine (oleo). 11. Gelato is also denser than ice cream, because less air (overrun) is being incorporated during the freezing process. That explains why gelato is typically more expensive than ice cream: it is harder to make than conventional ice cream, has a higher concentration of ingredients for the same weight of ice cream, and even though it can be stored at low temperatures, it is also usually only consumed freshly made. 12. Genuine gelato can be divided into two categories: milk-based (dairy) and fruit-based (non-dairy) gelato. Cream-based gelato can further be subdivided into white-based (fior di latte) gelato (from which the flavors stracciatella, torroncino, cassata, croccantino, nocciola, caffè, meringa, bacio, cocco, pistacchio, yogurt are produced) and yellow-based gelato (with egg yolks) from which the zabaione, spagnola and caramel flavors are made. 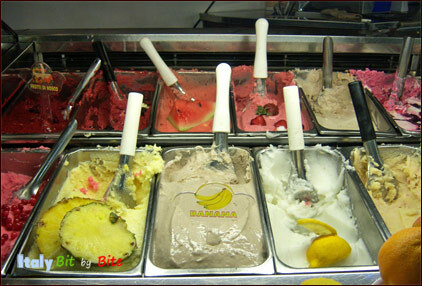 When no milk products are used the fruit gelato is usually called sorbetto. Some flavors such as lemon exist both as gelato and as sorbetto. Due to the increasing number of allergies and food intolerances new products have appeared on the market such as gluten-free or milk-free flavors, which include rice or soya milk fats instead of milk fats. Now that we have seen how to pick a good gelateria and what differentiates genuine gelato from regular ice cream, we are ready to order a delicious gelato cone or cup. 13. To order a gelato, pay at the cashier first, indicating the size of cone or cup you want (you can specify how many different flavors you want when you are at the gelato counter), get your receipt and then hand it over at the gelato counter repeating the size of cone or cup you have paid for and the number and types of flavors you want. As we already mentioned, the number of flavors is independent of the size of your cup or cone. You may choose to have 2 flavors in your 2 euro cup, or three flavors in your 1.5 euro cup. The only ristriction to this is that some flavors do not fit onto a cone. As the gelato's consistency depends on the balance between ingredients without adding artificial ingredients that help 'solidify' it, some gelaterie prefer to serve flavors such as zabaione and tiramisu (usually yellow-based flavors) only in cups. Again, this is a sign of quality, so nothing to be suspicious about. 14. Fruit-based gelato is made absolutely without water or juices, but still contains some milk fat and proteins. Fruit based gelato contains at least 15% fruit and 18% sugar, except agrumi which contains around 10%). Genuine sorbetto is made according to the same quality standard as gelato, only it does not include milk products and is always made from fresh fruits. Top quality sorbetto may contain up to 65% of fruit. Granita is made with sugar syrup (water and sugar) mixed with fruit juice or artificial fruit syrups. Sorbetto also has a finer grain than granita. Semi-freddo is cream to which a particular ingredient has been added to obtain the corresponding flavor. In industrial or factory-made fruit gelato or ice cream fruit juices (in the best case) or artificial flavors are used instead of fresh fruit. Photos of the YourGuidetoItaly.com banner (from left to right): (on campus) Sean Locke, (red deckchair) Valentina Jori, (chianti botlle) Donald Gruener, (Vitruvian man) Jodie Coston, (coliseum), Roberto A Sanchez, (Fiat 500) tizianoj, Photo of 'Rialto bridge' by S. Greg Panosian. Italy regions image by Frizio. Gelato photos (top to bottom): Gelato display © brunobarillari/Fotolia.com; Produzione propria sign © fotoeg/Fotolia.com Italian gelato spatula © Comugnero Silvana/Fotolia.com.